NewsGotta play hard this summer with BEcherovkaTONic! Gotta play hard this summer with BEcherovkaTONic! This summer did vibe, play and taste great – just no doubt about it. Not only did it do at cafes and pubs but also in parks and as an absolute hit (you’d better check out) in community centers. This summer did vibe, play and taste great – just no doubt about it. Not only did it do at cafes and pubs but also in parks and as an absolute hit (you’d better check out) in community centers. Everybody had a chance to have a blast in these places with BEcherovkaTONic because great music, nice people and obviously an authentic drink definitely weren’t in short supply. Picnic blankets decorating parks – a view so peculiar to European cities – became a full blown reality in Slovakia too. 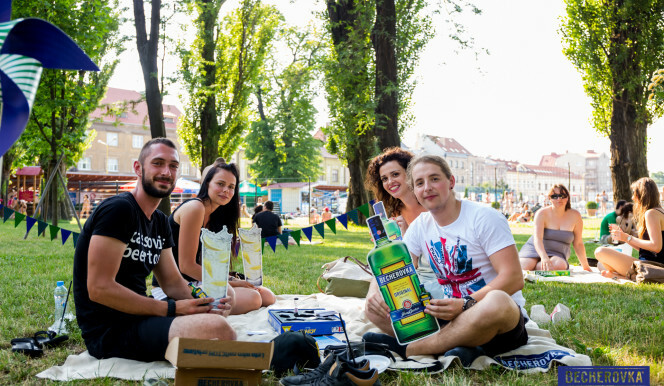 Whoever following signs in the parks of Trenčín, Košice, Piešťany or at the Mall Central in Bratislava (OC Central in Bratislava) could enjoy Becherovka picnic lying down casually on a blanket, taste the original BETON drink, barbeque specialties or try a game like Frisbee, chess, activity or badminton. On top of that the first 50 picnickers were awarded a box with snacks and a minute bottle of the delicious herb spirit. Everybody was more than welcome to fully enjoy the ambient tunes performed by the band LaBon which definitely goes hand in hand with the BETON experience. In cooperation with Becherovka original BETON centers had the chance to get acquainted with places all over Slovakia. Young people not preoccupied only with themselves but also with the neighborhood they live in, could take an active part in developing and beautifying it, finding new acquaintances while getting carried away by artistic flows. Several webpages like www.becherovka.sk/nabeton, instagram.com/BECHEROVKASLOVENSKO, or fun page facebook.com/BecherovkaSlovakia were available offering various ideas to make the best of this summer including recipes of drinks with Becherovka in order to get the best BETON experience ever. Pour Becherovka in a glass with ice cubes in it, grapefruit juice, fill it up with tonic water and mix it thoroughly. Enjoy the drink decorated with a wedge of red grapefruit and berries of red grapes.